In Philadelphia’s 2-0 Game one loss to the Capitals on Thursday, Dave Hakstol’s Flyers were gifted three power play opportunities in the first period. It represented a golden chance for Philadelphia to get on the board early, set the tone for the game, and take some of the wind out of the sails of the Washington fans. Instead, what resulted from those six minutes of power play time was a series of frustrating, ineffective zone entries and low quality shots from the perimeter that Braden Holtby saw coming. Against a team like the Capitals, the Flyers are not going to get a lot of prime scoring chances, especially at even strength. 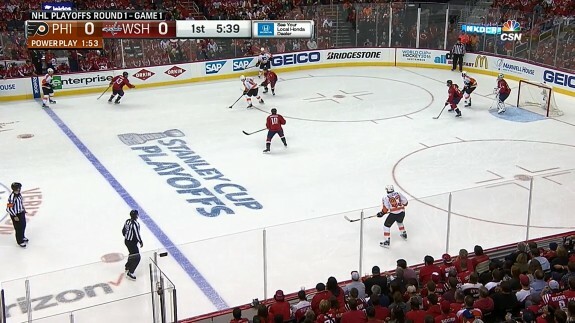 If the Flyers are going to have a chance to win this series, their power play is going to need to produce. If Thursday’s performance is any indication of what’s to come, then the Flyers have a real issue on their hands. There are a number of things that are wrong with this Philadelphia power play right now. Let’s go through them one by one. Who’s the First Unit Again? The Flyers’ power play units have remained mostly the same over the last portion of the season. The first unit consists of Shayne Gostisbehere at the point, Claude Giroux and Jakub Voracek on the half boards, and Wayne Simmonds and Brayden Schenn in the low and high slot, respectively. The second unit features Mark Streit, Sean Couturier, Matt Read, Ryan White, and Sam Gagner in the same roles. That will obviously change with Couturier being out for the series. Nick Cousins likely slots into his spot on the second unit. Looking at the two units, you would think the first unit should be racking up the goals compared to the second unit. That was the case for most of the year. Indeed, that first unit combined for 39 power play goals during the year with the second unit contributing 11. For most of the year, the first unit was dynamite and the second unit looked putrid. But now, when they need them most, it has been the first unit that has looked poor, and the second unit looks like the more capable group. The first unit managed to score a couple goals on the power play in the last quarter of the season, but they were largely on broken scramble plays due to a turnover and not because they set up effectively and worked the puck. Teams have begun shading towards Giroux and Gostisbehere on the Flyers’ power play. How do you beat that? Well, it doesn’t take a rocket scientist to realize that you need to stop being so dependent upon those two to create offense. The other three members of the power play need to move more, and make themselves an option instead of staying stationary. Wayne Simmonds makes his living in front of the net, but needs to move more to make himself a passing option. In previous years, Simmonds would pivot to the side of the net and make himself a passing option. He would then make a stuff attempt, or make a backdoor pass to Voracek, who had snuck in from the point. And here’s where the pivot opened up a passing option, and Simmonds was able to find Voracek on the backdoor for a goal. Look at where Voracek is in this clip, because that’s where he needs to be on the Flyers’ power play right now. He is just as guilty as Simmonds in terms of staying stationary. Even worse, he has the tendency to stand far out at the point where he is far from a scoring threat, and not helping out his teammates as a viable passing option. 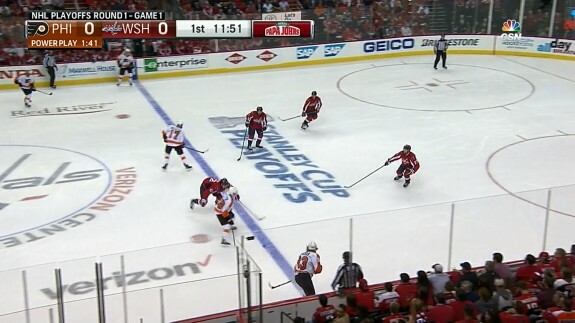 This is not the correct positioning for Voracek on the power play. Look at all of that open space in front of Voracek because of the tight coverage on the Giroux/Gostisbehere side, and there he is standing at the point. He has done it less over the past few games, as I’m sure the coaching staff has pointed out he needs to move in more, but he is still guilty of it on occasions. After averaging nine power play goals over the last three seasons, Voracek finished this regular season with just one. Part of that is the addition of Gostisbehere as a significant part of the power play, but part is that Voracek just doesn’t seem himself. Whether it’s the lower body injury that kept him out for two weeks at the end of the season (he was seen in a walking boot) or confidence, Voracek isn’t finishing on the power play. Last night, for one brief moment, everything came together and the Flyers were able to get a quality scoring chance. Below you can see Washington shading towards the Giroux/Gostisbehere side, but Simmonds moves to open up a lane down low and Voracek is at the dot. The result is open space for Brayden Schenn in the high slot, who got off a quality one timer that was stopped by Braden Holtby. Simmonds pivoting to the side of the net and Voracek moving to the dot created open space for Brayden Schenn, who got off a one timer from a high danger area. Another problem the power play has encountered is that they are unable to enter the zone with speed and possession of the puck. It’s been proven that controlled zone entries result in significantly higher shot attempts than non-controlled (dump-ins). To enter the zone on the power play, the Flyers have been using what is known as the “slingshot”, where a player carries the puck through the neutral zone, then drops the puck to a trailing player who has speed, who then carries the puck into the zone or makes a quick pass to another player. 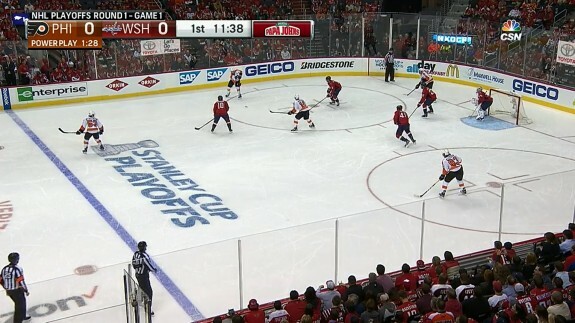 The shape of the players on the ice resembles a slingshot, hence the name. The slingshot zone entry is not working for the Flyers. As you can see, every single member of the Finnish attack is moving at the same time, causing misdirection and confusion among the Czech defense. For the slingshot to work, everyone has to be moving and on the same page. It’s not easy, but if you do it right, it’s extremely effective. If the Flyers want to win this series, Dave Hakstol need to make changes to the power play, and soon.